In this article we present you with optimal Caribbean stud poker strategy, which will lower the house's advantage as much as possible and at the same time help control the amount of bankroll fluctuation you may face. Read through the strategy below to know when to fold. This game originated in the Caribbean on board a cruise ship which gives you some insight into the kind of vibe you will get when you play this game – a lot of relaxed Caribbean fun! . You only play against the dealer and not against the other players at the table, making this quite a friendly game amongst players. When the game originated, players were most likely sipping a delicious Caribbean cocktail and having a laugh with each other as they played, more than wanting to compete fiercely against each other. So the first objective of the game is to chill out, have a drink, and feel the holiday vibes as you play this fun game. Now, if you want to win, remember that when you play you have to keep in mind that the aim of the game is for your five cards to beat the dealer’s five card hand. The winning hands are the same as you would find in a regular poker game, but obviously there are some differences too which you can read about on our rules pages. The game is played from a regular 52-card deck, with each player as well as the dealer receiving five cards. Revise the strategy below before playing so you can give yourself the best chance of having a winning hand and beating the dealer. One of the reasons for the popularity of Caribbean Stud Poker online is the simplicity of the game, which leads a lot of people to assume that there is very little strategy involved. Caribbean Stud Poker has a built-in house edge of 5.26%. So for every $100 a player wagers, in the long run they should lose $5.26. This is quite a hefty price to pay, so the odds are not exactly in favor of the player, but it’s still not the worst of all online casino bets. 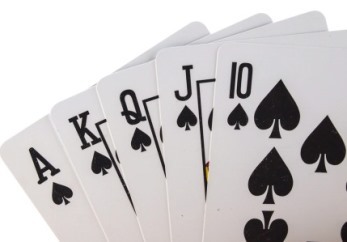 1) The player folds and loses the ante bet. 2) The player raises and wins only the ante bet because the dealer fails to qualify. 3) The player raises and wins both the ante bet and the raise bet because the dealer qualified and the player's hand beat the dealer's hand. 4) The player raises and loses both the ante bet and the raise bet because the dealer qualified and the dealer's hand beat the player's hand. Of course, sometimes the decision to fold or raise is easy. For example, if you have a flush or a full house, you should raise and hope that the dealer also qualifies. However, as stated above, there are times when you must fold: for example, when you are dealt a hand without a pair or an A-K.
Don't Forget: The odds are in your favor if you are dealt a pair, so you should always raise. But what about non-paired hands? The player should fold a non-paired hand that does not have an A-K. Have a look at the chart below to see when the player should make the raise bet. *The reason the dealer's upcard must match one of the player's cards is to reduce the chance of the dealer having a pair. Here we'll explain the odds and probabilities in Caribbean Stud Poker. We'll try to keep it as simple as possible. The first thing you should look at is the chances of being dealt a specific hand from a fresh deck. Below, you will find the hand, the number of possible ways of attaining that hand, and the corresponding odds. Knowing the odds that you will get a particular hand will help you understand how to bet, and also help you understand the particular payouts for a particular winning hand. Now that you have the probabilities of getting the hands, have a look at the usual payouts for each winning hand. You'll most likely notice the payouts don't necessarily reflect the odds of attaining the hands, but unlike other poker games, there is a distinction between simply winning, with say, two pairs, and with winning in style with a royal flush. If you do win some money, remember to check out the payment methods available to withdraw your winnings. There is also the option of playing the progressive jackpot version of this game as well if you want to add some extra spice. You can read about how to play this side bet on the Caribbean stud rules page, but if you want to know whether it’s worth playing or not then remember that you can win 100% of the payout with a royal flush or straight flush, $150 for a four of a kind, $100 for a full house, and around $50 for a flush. Always check these payouts with the online casino you’re playing at at the time as the payouts can sometimes fluctuate a bit from casino to casino. However, what you need to keep in mind here is the house edge. The house edge is approximately 25-27% making it an absolutely horrific wager for you to play. It may seem like a small investment, one dollar per bet, but so many hands can be played in a short time in this game that it can quickly spiral out of control. If you have the full bank account and wallet to warrant throwing money away, then go right on ahead. But if you want to minimize losses like a straight-headed human being then play the game without betting on the progressive side bet. Is it possible to play with a Caribbean stud poker strategy? Yes you absolutely can. Read through our article to understand which decisions you can make when you are dealt particular cards in order to increase your odds of winning against the dealer. Can I practice Caribbean Stud Poker Strategy for free first? Most online casinos have a free Caribbean stud poker game for players to test out the waters before playing online for money. Particularly when you want to play with strategy, it’s a good idea to practice in a risk-free environment first. What are the rules I need to learn before playing Caribbean Stud Poker online? The rules to the game are quite easy to learn, you should visit our Caribbean Stud Poker rules page to learn the gameplay and bets you can make. Is it wise to play the progressive side bet? Due to the very high house edge of this bet, it isn’t a wise move if you care about keeping and making as much money as possible. When you play online Caribbean stud poker you can relax and have some fun with the other players via chat as you compete against the dealer. You can make the fun more interesting by playing online using the best Caribbean stud poker strategy. Choose from one of our top online casinos to put your skills to the test!